The biggest and most dramatic change made was the color of the cabinets. I wanted black to match my old country hutch so I bought two cans of paint and viola. The entire feel of the room was changed. Dan chose the hardware... Not my pick AT ALL. In fact I hate these handles. Oh the things we do for love. But I did try to country it up by adding knobs to all of the drawers and some of the cabinets. Not sure if this mix fits in with the standards of today's interior design, but I am pleased. Within this phase we also replaced the stove/hood, ice box, and dishwasher. And though buying appliances is expensive, we were able to make it work somehow. All pieces were clearance and together cost us less than 1,300.00, which is a bargain! So I am in love with canisters. Especially homemade mason jar-ish ones. I couldn't find any at the store (TJ Maxx: for some reason I can always find what I am looking for there) So I decided to give it a go and make my own. First I looked for large mason jars at hobby lobby and I found that they were super expensive. I can't remember the exact price, but I'm thinking it was somewhere around 15 bucks per large jar. And I wanted three! I decided that was just too much money in the end and I went home. Then I had a brilliant idea. 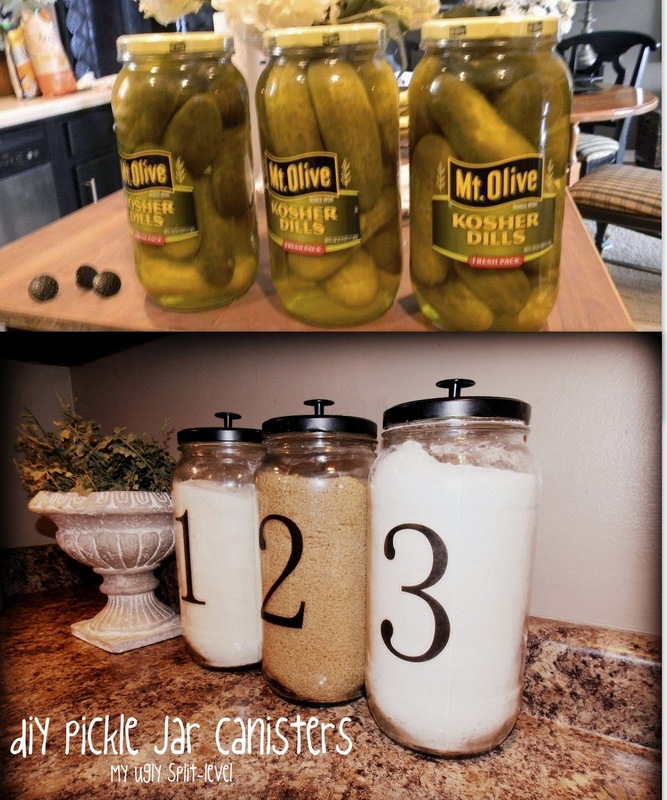 I would make them out of pickle jars. They are huge and they are only 3 dollars at Walmart. Then I painted the lids, poked the screw through the center of them and tightened on the knob. And bada-bing-bada-bang! They were done and looking fancy. Later I decided I would add some numbers to the front to make them more whimsical. I dig it. I did this by printing numbers (using my plain old Lexmark printer) onto window decal paper. You can buy it from Staples for about 10 bucks for 15ish sheets. BUT the ink does wipe off with water so I put the inked decal on the jar and then covered it with a clear decal to protect it. The numbers were just made in Word. The font is called Fangsong. Then I added font via Picasa (a free picture editing program) and modge podged it onto the fronts. The font was found in the 'edit in creative kit' option. It is called Sue Ellen. We adjusted the length and width to make it fit our kitchen. We also connected it different than the original plan so that our legs would stick out from the under trim (gives it more shape). Otherwise we used the same stain, but our cabinet black paint. And I absolutely love it! Oh and that price this woman gives is totally not correct. This was just a little over 100 dollars. Which was not at all what I wanted to spend, but once I saw the finished product I felt it was totally worth it. This was the worst! I could not find anything I loved for the window (which I think is due to the fact that I hate the window, but that will be another phase...maybe phase 16 or something) Finally I found this awesome tutorial on turning regular blinds into a roman shade- a FUNCTIONING roman shade. What?! Not just three tension rods like most tutorials show? That's right folks, there is a way... But it is a tedious and long process. All together, the fabric, the glue, and the shade ran a total of 15ish bucks. That is AMAZING compared to ordering a roman shade from a department store!! Here is the tutorial peeps, and here is my shade. It's a bit plain and blase, but that is what I love about it. And once my industrial light fixture is hanging over that baby (my next phase :), it will be glorious. Although I love this shade, I was a bit cheap when it came to making loops- which meant buying more fabric and having longer spaces between blind slats. I wish now that I would have done that because then I would have more loops like the one in the tutorial...But as this was extremely time consuming, I will not be redoing that any time soon. We added this awesome pendant light I found on clearance from Home Depot for 15 bucks. Then we bought one of those can light/pendant converter kits and Dan rewired it to this light. Over all it was about a 30 dollar project. I loooove this. My house is almost the exact same as yours! It looks like your kitchen/dining are open to each other though, whereas mine has walls there- which gives me hope because we would love to knock some walls down eventually! Ha! This is wonderful. I love the island. I'm so happy I found your blog, it gives me inspiration for my own home! I too have a very ugly split-level which I have been callin a raised ranch. I grew up in a very rich in character area of upstate NY and when I moved downstate, to the slap-up-and-sell area outside NYC, I found myself wondering how to add character to a cookie cutter house. Your home is exactly the style I admire and wish I could dream up myself. So curious about your living area downstairs. Ours is dungeony feeling and we just got all new hardwood flooring so we have the room to redecorate. But I'm at a loss! What did you all use to cover where the old ceiling fan used to be? We have a similar situation and I am wanting to add can lights, as well. Please keep posting updates on the progress! I'm finding tons of inspiring ideas! popcorn ceiling spray over the area to match our existing ceiling. Then we repainted the ceiling. Hope that helps! We have a 1982 split foyer.........ugly too. I really like everything you've done. Gives me some hope! Love your cabinets!!! We have similar sad white ones and this makes me want to give them a facelift! Do you have any idea if you could use counter top instead of wood on the top of island? I have thought about that and I am not sure. You would have to be able to buy one that doesn't have the backsplash. They might sell counter like that, but you would have to make your island the standard size of base cabinets. If not, you could order one for sure. It's just a little more pricey. Thank you- just trying to think about it in my kitchen. Love the idea! 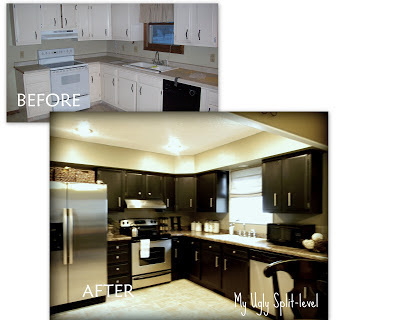 One more thing--- Do you know the changes you made to the plan to fit your kitchen? Thanks for sharing, Love the DIY ideas. Wow, thank you so much for sharing your journey transforming your split-level. We just purchased one for a STEAL of a deal and now i'm trying to figure out how to make it look good. 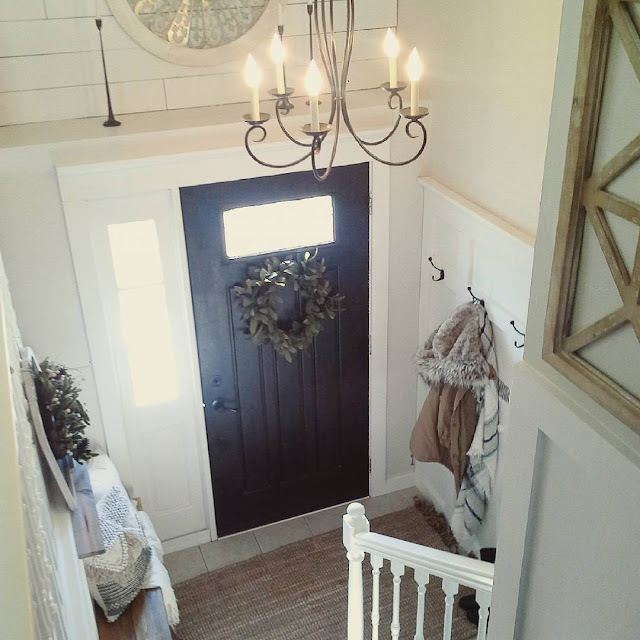 I'm taking a lot of notes from your blog :) Great job creating an amazing home- what a transformation. Love Love Love!!! What kind of paint did you use for the cabinets? Also, did you have to sand down before hand? 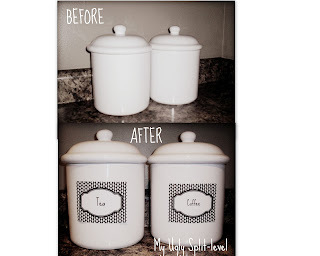 I just started a blog on frugal living and you have given me inspiration to do some diy posts. I always told myself if it was too simple no one would want to see how to do it because they probably already thought of it. But this is simple and I never thought of this so thank you! If you ever visit new blogs I would love for you to check out mine and give me some feedback if you would like. I take feedback from amazing bloggers like yourself seriously and I welcome it. Oh my goodness, I am terrible because I have this account connected to an email that gets so much spam that I never see new comments. So I apologize to you and everyone for answering these so ridiculously late. Thank you! I am not an expert at all! I have no sponsors and I don't make anything from this, but I am flattered that you think of me in that way. I will check out your stuff asap! 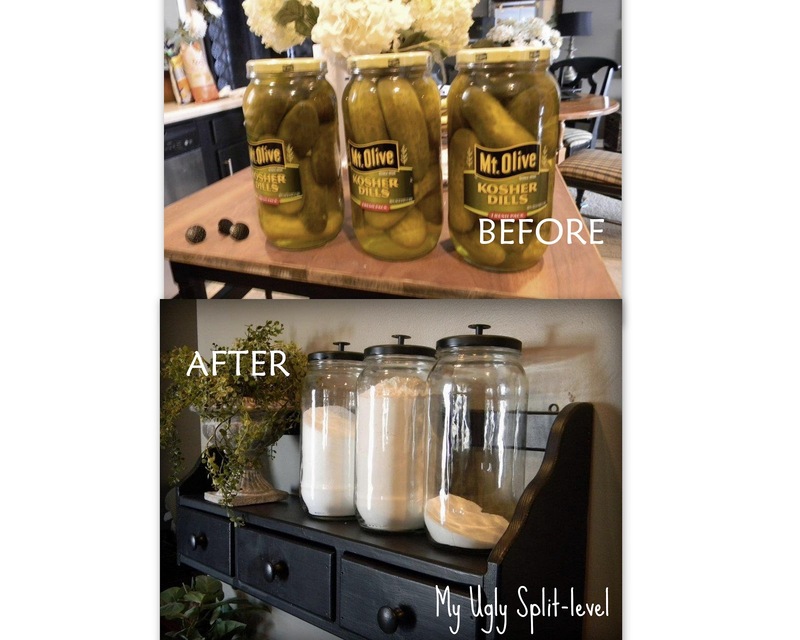 What rubber seal did you take off the pickle jars? How did you get the label off the pickle jar? Great renovation! Looks like absolute make over. Just as my kitchen when I left it in the careful hands of the http://thehomeexpert.uk/.